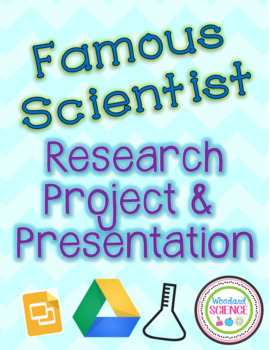 This is a project where students research a famous scientist and create a google slide presentation over the information. 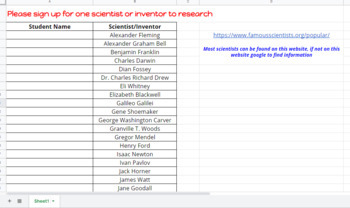 I let students sign up for a scientist by posting the sign up sheet on google classroom. For lower level students, I give them a printed copy of the guided worksheet and let them fill this information in first. 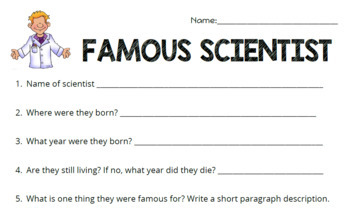 Then, students will create a google slide presentation about their scientist. 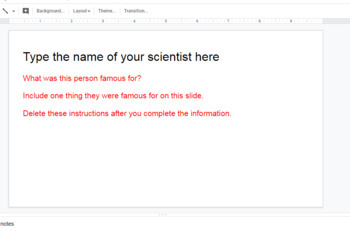 I have students present their project and other students fill out a "presenter evaluation" form on google forms. This part is optional. All of the included files are editable for your classroom use. This is a great end of the year project. • Look for the green star next to my store logo and click "Follow me" to become a follower. Follow me! AND Pin with me! Copyright © Woodard Science. All rights reserved by author. This product is to be used by the original downloader only. Copying for more than one teacher, classroom, department, school, or school system is prohibited. This product may not be distributed or displayed digitally for public view. Copying any part of the product and placing it on the internet (even a personal/classroom website) is strictly prohibited. Failure to comply is a copyright infringement and a violation of the Digital Millennium Copyright Act (DMCA). Clipart and elements found in this file are copyrighted and cannot be extracted and used outside of this file without permission or license. Intended for classroom and personal use. See product file for credits.